The Wright brothers – Orville and Wilbur Wright are credited with building and flying the first heavier than air aeroplane. They achieved the first recorded flight on 17 December 1903. Over the next ten years, they continued to develop the aircraft making a significant contribution to the development of the modern aeroplane. Their particular contribution was in the effective control of an aeroplane, through their three-axis control system. This basic principle is still used today. It was for this control mechanism that the Wright’s received their first US patent – 821,393. Orville and Wilbur had two elder brothers Reuchlin (1861-1920) and Lorin (1862-1939), and a younger sister Katharine (1874-1929). Their parents were Bishop Milton Wright (1828-1917) and Susan Catherine (Koerner) Wright (1831-1889). Their father worked as a minister in various churches, and as a consequence, the family frequently moved around. Their father encouraged his children to read widely and discuss issues. 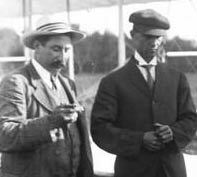 This climate of intellectual creativity and stimulus encouraged the Wright brothers to pursue a range of interests and studies. When they were young, their father bought them a small ‘helicopter’ – built in France. They later commented that this helicopter sparked an interest in flight and they sought to build similar models themselves. Around 1885, Wilbur became withdrawn after sustaining a facial injury during a game of ice-hockey. This injury and the resulting depression caused Wilbur to give up his dreams of studying at Yale. Instead, he remained close to home, helping his father with ministerial tasks and looking after his ill mother. However, Orville was determined to try new things, and his enthusiasm helped draw his brother Wilbur into new projects. In 1889, they designed and built a printing press which, for a short time, published a daily newspaper. In 1892, the capitalised on the ‘safety bicycle’ boom and opened a bicycle shop; this was commercially successful and also enabled them to develop their skills as designers and engineers. Around the turn of the century, there was considerable interest in the possibility of flight. Most of this centred on gliders. 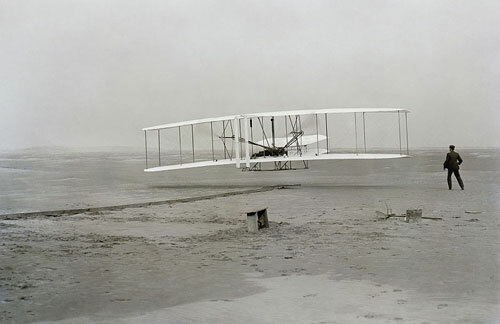 But, the Wright brothers began to explore the possibility of mechanised flight with heavier than air aircraft. For both brothers, the dream of flying became an all-consuming passion. They concentrated on building a more powerful, but lighter engine and worked on an innovative design for controlling the plane once airborne. They used funds from the bicycle shop to start testing at Kitty Hawk, North Carolina. It was a windy environment which helped give planes lift off. They made extensive tests and also recorded a range of data about possible flights. Even at the turn of the Century, many were doubtful that man would ever be able to fly. On December 17, 1903, the Wright Brothers made the first historic, aeroplane flight, where Orville piloted the plane (called ‘the Flyer’) with Wilbur running at the wing tip. Five people witnessed the first flight, including John Daniels who took the famous first flight photo. Over the next few years, they continued to develop their aircraft. However, they were conscious of needing to gain strong patents to make their aircraft commercially viable. They became reluctant to reveal too much about their flights and disliked reporters taking photos of their designs. Their secret approach and competing claims by other aircraft designers meant that for many years their inventions and flights were met with either indifference or scepticism. However, in 1908, Wilbur began public demonstrations in Le Mans, France. His ability to effortlessly make turns and manoeuvre the aircraft caused a sea change in public opinion, and the display of technically challenging flights caused widespread public acclaim and enthusiasm. In 1909, Wilbur made a public flight up the Hudson River in New York, circling the Statue of Liberty. The 33-minute flight, witnessed by one million New Yorkers, established their fame in America. 1905 – built an aeroplane that could fly for more than half an hour at a time. 1908 – Orville Wright made the world’s first flight of over one hour at Fort Myer, Virginia, in a demonstration for the U.S. Army, which subsequently made the Wright planes the world’s first military aeroplanes. 1908 – Wilbur made over 100 flights near Le Mans, France; the longest one, on Dec. 31, a record flight: 2 hours, 19 minutes. The Wright’s made their first application for a patent in 1903, but it was rejected. In 1904, they hired a patent attorney, who helped them gain their first patent. However, other aviators attempted to circumnavigate the Wright brothers patents, leading to painful and costly legal battles in the courts. In the last two years of his life from 1910 to 1912, Wilbur played a key role in the patent struggle. His family believed this contributed to his premature death from typhoid fever in 1912. The brothers never married. 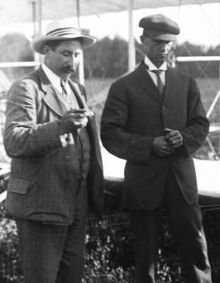 Wilbur once quipped he “did not have time for both a wife and an aeroplane.” Orville Wright died of a heart attack at age 77. The original Wright Flyer rests in the National Air and Space Museum in Washington D.C. with the inscription. Citation: Pettinger, Tejvan. 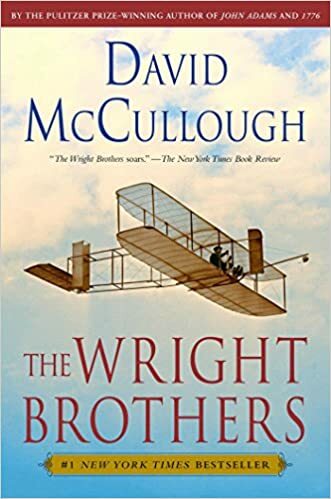 “Biography of The Wright Brothers”, Oxford, UK. www.biographyonline.net 23rd June 2010. Last updated 7th March 2018. Famous Americans – Great Americans from the Founding Fathers to modern civil rights activists. Including presidents, authors, musicians, entrepreneurs and businesspeople. Featuring Thomas Jefferson, Abraham Lincoln, Madonna, Oprah Winfrey. People who changed the world – Famous people who changed the course of history including Socrates, Newton, Einstein and Gandhi. this was extremely helpful for a timeline and 4 paragraphs.. I recomend it very strongly!